Dr. Sigmund Freud was born to Jewish parents in the Austrian Empire in the mid-19th Century. He came to regard the monotheistic God as an illusion based on the infantile emotional need for a powerful, supernatural pater familias. He believed that in modern times (early 20th Century) religion could be set aside in favor of reason and science. Author (The Chronicles of Narnia) and Oxford professor C.S. Lewis was raised in the Church of Ireland, became an atheist at 15 and returned to Christianity at the age of 31 due to the influence of fellow Christian writers G.K. Chesterton and J.R.R. Tolkein. 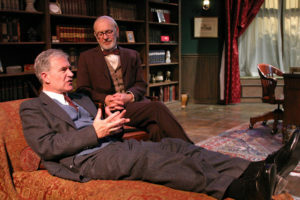 Although Freud and Lewis never met in real life, playwright Mark St. Germain has imagined a lively theological debate between the two men in Freud’s Last Session, currently at the Odyssey Ensemble Theatre. The result is a lively intellectual debate between very different and strongly held viewpoints and provides the audience with a lot to think about. 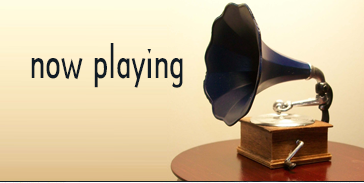 St. Germain sets his play on September 3, 1939—the day England entered World War II. Freud is in the final days of his long life but still up for a good battle of ideas. Suffering from inoperable cancer of the mouth and equipped with an ill-fitting prosthesis for his palate, he is in a lot of pain and, with the help of his doctor, will end his life in less than three weeks. The two men each score points for their beliefs and part agreeing to disagree. Director Robert Mandel keeps the talky play from becoming dull and monotonous by providing plenty of movement for his actors on Pete Hickok’s well-appointed set. 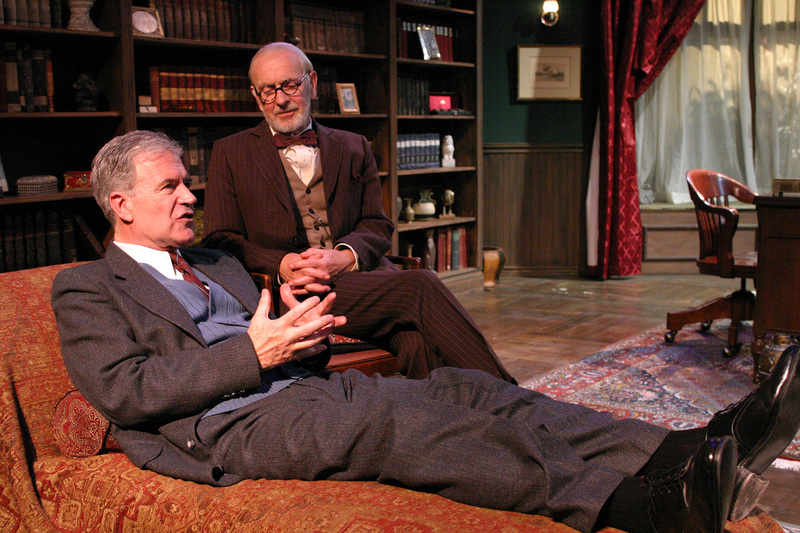 Martin Rayner brings a gentle irascibility to his Freud (a role he created in its World Premiere at Barrington Stage Company and in subsequent productions). His analytical mind is not dulled by the pain inflected by his cancer; instead he fights even harder to put across his beliefs. Martyn Stanbridge has the less showy role of Lewis, a man whose faith is precious to him because of his rediscovery of it. The actors are evenly matched and play very well off each other in the 80 minute intermission-less piece. This is the rare one-act play you wish was longer so you could experience even more intellectual fireworks and first class acting. 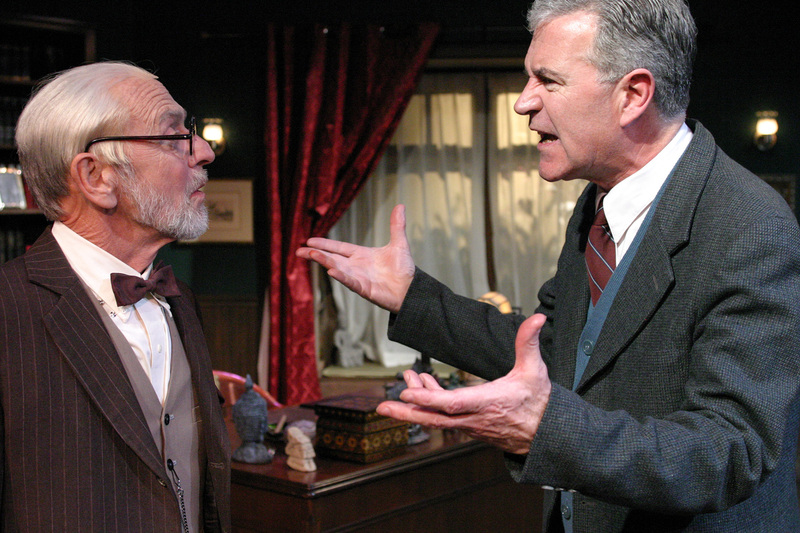 Freud’s Last Session should be one of the first plays you see in 2018.